Ceramic wall: The ceramic wall can block contaminants over 0.1um, Effective filtration of water red worms, scale, sediment, floating objects, odor, rust, bacteria, residual chlorine, coli, salmonella, MRSA, and big particles, etc. Activated carbon: The activated carbon reduces odor, organics, phenol, arsenic, lead, cyanide, ect. Check your faucet at first, if there is an aerator on the faucet spout, unscrew it. 1. Faucets with outside thread: The outside threaded diameter is about 22mm. 2. Faucets with inner thread: The innner threaded diameter is about 24mm. 4. Faucets without thread : The outside diameter is between 15~21mm. and the faucet spout length must be longer than 2cm,or it will be easy to slide down. 5.Will not work with pull-out or hand-held faucets. Note: For fresh clean water, please replace filter cartridge every 2-3 mont+hs. How To Clean Water - Sink water filter certified to remove 99% of lead, and over 70 other contaminants including 96% of mercury and 92% of certain pesticideslime,mold, and fungi.This product can filter a small part of chlorineof water. Careful consideration before ordering. 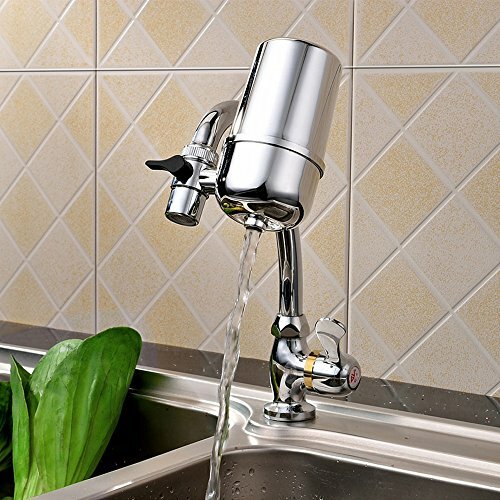 Sturdy Construction - Faucet filter made from durable, the shell is made of environmental protection food grade ABS plastic, zinc plating process, no discoloration, no rust,skid proof and explosion-proof,durable and healthy. Fit Most Faucets - Tap water filter easy installation, simple and quick, no extra tools needed,add a silicone seal or Teflon tape if need to prevent the leak problems.Can't fit for pull down/pull out faucets and unconventional faucets. If you have any questions about this product by Six-Seven, contact us by completing and submitting the form below. If you are looking for a specif part number, please include it with your message.